CRISPR/Cas9-mediated disruption of genes associated with eye pigment caused eye color to change from Black to white. Credit: Michelle Bui, UC Riverside. 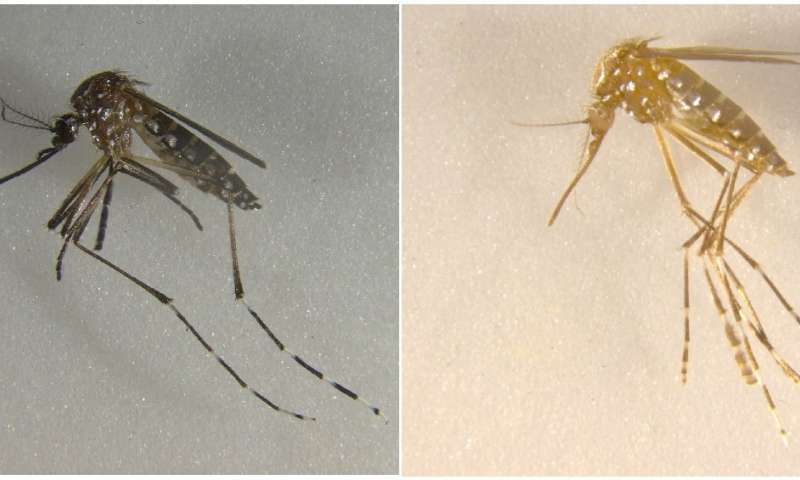 Researchers at the University of California, Riverside have developed transgenic mosquitoes that stably express the Cas9 enzyme in their germline. The addition of Cas9 will enable the use of the CRISPR gene editing tool to make efficient, targeted changes to the mosquitoes' DNA. As proof of concept, the researchers used the system to disrupt cuticle, wing, and eye development, producing completely yellow, three-eyed and wingless mosquitoes. Their long-term goal is to use Cas9-expressing mosquitoes together with another technology—called gene drives—to insert and spread genes that suppress the insects while avoiding the resistance that evolution would typically favor. Aedes aegypti are major carriers of dengue, chikungunya, yellow fever, and zika viruses, and are rapidly becoming resistant to commonly used pesticides. Published today in the Proceedings of the National Academy of Sciences (PNAS), the study was led by Omar Akbari, an assistant professor of entomology in UCR's College of Natural and Agricultural Sciences and a member of the university's Institute for Integrative Genome Biology. Previous efforts to use genome editing to prevent mosquitoes from spreading pathogens have been hampered by low mutation rates, poor survival of edited mosquitoes, and inefficient transmission of disrupted genes to offspring. Akbari and colleagues developed transgenic mosquitoes that stably express a bacterial Cas9 enzyme in the germline, enabling highly efficient genome editing using the CRISPR system. CRISPR works like a pair of molecular scissors, cutting out and replacing specific DNA sequences based on a ribonucleic acid (RNA) guide. In the paper, the team used the system to disrupt genes that control vision, flight and feeding, resulting in mosquitoes with an extra eye, malformed wings, and defects in eye and cuticle color, among other changes. CRISPR/Cas9-mediated disruption of genes associated with cuticle pigment caused mosquitoes to turn from black to yellow, and disruption of genes associated with eye pigment caused eye color to change from black to white. Credit: UC Riverside. Akbari said these strains represent the first step toward using gene drive systems to control mosquito populations and reduce the diseases they spread. "These Cas9 strains can be used to develop split-gene drives which are a form of gene-drive by which the Cas9 and the guide RNA's are inserted at separate genomic loci and depend on each other for spread. This is the safest way to develop and test gene drives in the laboratory to ensure no spread into the wild," Akbari said. Gene drives greatly increase the odds that a gene or set of genes will be passed on to offspring—from 50 percent to 99 percent. This number can potentially increase to 100 percent when a target gene is disrupted in multiple sites, a technique called multiplexing that has recently been mathematically modeled by Akbari and colleagues at UC Berkley. Gene drives can be used to bias genetic inheritance in favor of rapidly spreading, self-destructive genes—such as those that disrupt fertility—and could be an environmentally friendly and cost-effective way to suppress populations of disease-spreading insects. "Next steps should be undertaken to identify the regulatory sequences that can be used to express the guide RNAs from the genome, and once these sequences are identified developing gene drives in the species should be turnkey," Akbari said. 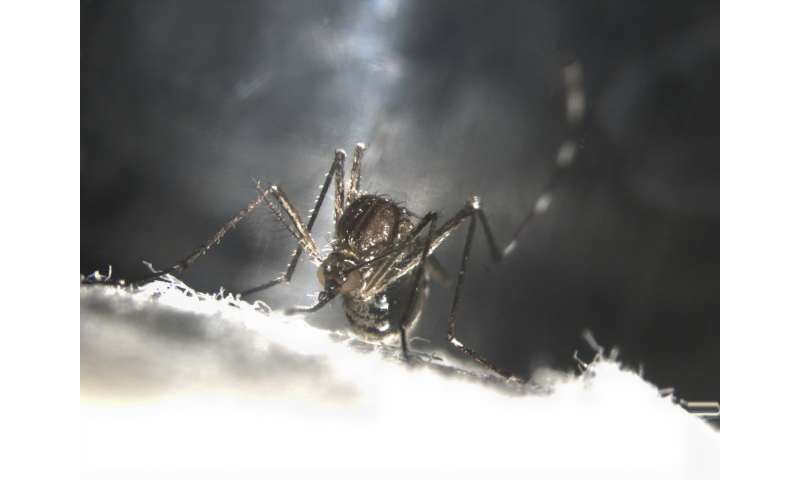 The title of the paper is "Germline Cas9 Expression Yields Highly Efficient Genome Engineering in a Major Worldwide Disease Vector, Aedes Aegypti." A very bad idea. The cas9 gene can be activated by any pathogen carrying Crisper. This means that infection of opportunity by viruses/bacteria is enabled this way. Since viruses are most often the diseases humans wish to disable, this cas9 idea must outrace viruses in the wild when competing with humans setting up a gene drive elimination. If a virus infected mosquito can reproduce, it bypasses the gene drive with whatever the virus injects. Most certainly the viruses in the wild will have a broad spectrum of injectable RNA/DNA. Some of this will (purely on a statistical basis) out-pace the gene drive humans try to implement. Worse still, the virus injection may make the cas9 gene drive fail by producing a gene that disables it in the mosquitoes DNA yet allows new versions to be inserted by the virus. This will become a game of "whack-a-mole". Oh I'm sure this has a more World War Z potential. A Mars trip will be a 69 day vacation in comparison. Anybody remember that hot sauce commercial where the mosquito explodes after biting a guy who'd been eating that sauce on a pizza?